What changed? I would advise you to listen to the current conference call: http://ir.oldrepublic.com/phoenix.zhtml?p=irol-eventDetails&c=80148&eventID=4797341 which will be available until July 3, 2012. It is a classic of how analysts view the stock price and the owner/operator/management views the reality of their business. Old Republic (“ORI”) announced a spin-off of their money-losing Mortgage Guaranty Insurance business (“MGI”) but then on Friday decided not to go through with the spin-off for various reasons. As you can see above in the short-term chart of ORI, the stock moved up upon announcement of the spin-off and the price neared $11 before plunging to below the pre-announcement price. No matter what your assessment of intrinsic value was or is now, the mathematics of future cash flows has never changed. Actual risk hasn’t changed, but the PERCEPTION of risk has. If you read through the conference call transcript, you will see that several analysts/investors do not understand how run-off insurance operates. Run-off means that no new insurance is underwritten while claims of the old (past) insurance are paid down from stated reserves. ORI will pay claims initially at 50 cents on the dollar as per the orders of their insurance regulators. Ironically, management (Aldo Zucaro – Chairman of the Board, Chief Executive Officer) bought shares last month around $9 to $10 per share probably never guessing that shareholders would respond to the announcement as they did. Note his exasperation in having to repeat over and over that the economics of the business have not changed. Note the gap between perception and reality. I have highlighted certain passages of the transcript for emphasis. Markets are efficient? Details of Old Republic’s Mortgage Guaranty and Consumer Credit Indemnity Businesses renamed Republic Financial Indemnity Group, Inc. (RFIG). This will help you understand ORI’s deferred payment obligation (“DPO”) for the run-off of its MGI business. The DPO keeps the Mortgage Indemnity Insurance unit SOLVENT via the orders of the insurance regulators and in terms of STATUTORY ACCOUNTING. The Statutory Accounting Principles are a set of accounting rules for insurance companies set forth by the National Association of Insurance Commissioners. They are used to prepare the statutory financial statements of insurance companies. With minor state-by-state variations, they are the basis for state regulation of insurance company solvency throughout the United States. Some say the market is efficient. What do YOU think? Who are the sellers? Post Script: I am backed up this week so I might be light on the posting. Be well and keep learning every day. NEW YORK (AP) — Moody’s Investors Service on Wednesday lowered its senior unsecured debt ratings for Old Republic International Corp., citing the company’s decision to withdraw plans to spin off a subsidiary. The Chicago-based insurance underwriter announced last week it changed plans to spin off Republic Financial Indemnity Group Inc. The move came after stakeholders raised concerns that the spinoff would not be in their benefit. The reversal prompted Moody’s to downgrade Old Republic’s senior unsecured debt ratings one notch to “Baa3” from “Baa2.” That’s the lowest possible investment-grade rating on Moody’s scale. Moody’s has a negative outlook on the ratings for Old Republic and its principal subsidiaries, which means there’s a 40 percent chance that the ratings could be lowered in the next 18 months. The ratings firm said its outlook reflects continued risk of liquidity strain at Old Republic International, should regulators find that capital levels its subsidiary, Republic Mortgage Insurance Co., falls short of requirements, triggering an early redemption of the parent company’s senior notes. Moody’s believes liquidity options exist in such a scenario but said such an event would still place pressure on Old Republic International. “The intended spinoff would have helped protect Old Republic’s bondholders and insurance policyholders from further deterioration at the troubled mortgage insurance operation,” Moody’s analyst Paul Bauer said. The risk of financial strain at Old Republic International could strain its subsidiaries’ financial flexibility, Moody’s noted. It also maintained an “A3” rating on Pennsylvania Manufacturers’ Association Insurance Co. and Pennsylvania Manufacturers Indemnity Co.
Old Republic shares ended regular trading down 4 cents at $8.29. The stock added 5 cents to $8.34 after hours. (Reuters) – Old Republic International reassured investors that scrapping plans to spin off its money-losing mortgage insurance business would not lead to a liquidity crisis as regulators were unlikely to seize the unit. The insurer had planned to separate the unit and had even entered into a deal to sell a fifth of the business in a leveraged buyout but shelved the plan following stakeholders’ objections. The company’s stakeholders include its regulators, the government-backed Fannie Mae and Freddie Mac and bank customers. Regulators in North Carolina have already placed the unit under supervision. It is now only allowed to pay claims at 50 cents on the dollar to preserve capital, leading to investor fears that the unit would be seized, triggering a default under the company’s debt covenants. Old Republic eased those concerns on a conference call to discuss the canceled spinoff. “We’re comfortable, based on our discussions (with our regulators), that receivership is not in play,” Chief Executive Aldo Zucaro said. He expressed confidence that the company would be able to either refinance its debt or amend the terms, should a default occur. Old Republic said the mortgage insurance (MI) unit, which stopped writing new business when its capital levels cratered last year, would continue to lose money for the next two years. “By (2014), our total loss since 2007 will have been $1.7 billion, versus the total accumulated profit of $1.8 billion booked in the first 26 years … of our mortgage insurance journey,” Zucaro said. The company said almost all its statutory capital – the standard claims-paying metric – comes from deferred claim payments ordered by regulators. Deferred payments count as a liability under generally accepted accounting principles. On a reported basis, the company said its mortgage insurance unit has no capital and that it does not have the funds to add to the business. “To just keep the company solvent, you’d have to come up with $250 million, which we are not committed to doing,” a company executive said. But even as the MI unit’s stakeholders got their way with the scuttled spinoff, many Old Republic shareholders are unhappy at the prospect of being saddled with the business for the foreseeable future. Investors from hedge funds SAC Capital, Anchor Capital, Divine Capital and others grilled company executives on options for the unit, including voluntarily placing it into receivership. “Why is it not better to simply spin this out and go out to your bondholders and amend the covenants if necessary or to go in receivership?,” Darius Brawn from SAC Capital asked on the conference call. Even a sale of the business to investors specializing in run-off situations, where they just manage the existing book till the policies are exhausted, seems unlikely. “I think the possibility of a runoff (investor) buying a mortgage guarantee business with regulatory approval is remote,” an Old Republic executive said on the call. The company said it sees no need to amend its debt covenants in advance of a seizure, something shareholders asked it to consider, because it does not believe the default will occur. “One of our sayings around here is that you don’t just jump off the roof because you’re afraid you’re going to fall off,” CEO Zucaro said. There are opportunities to learn all around us. The recent announcement of Microsoft’s $300 million investment in the Nook–Barnes & Noble’s eReader provides a reference point for valuation. 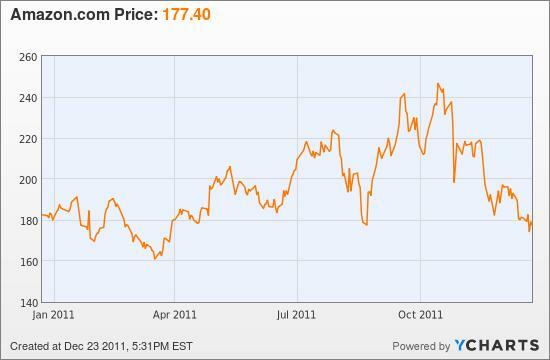 BKS and MSFT Agreement 8K April 27 2012 What valuation can you derive from MSFT’s purchase price? Try to think about how you would value BKS. If you struggle, then look at the case study materials below, then return to the financial statements. Don’t become discouraged. The research report below isn’t perfect (lacks a full competitive analysis of the different businesses), but the report does do a good job in showing you how the author reached a valuation. You may disagree with the assumptions, but you know what they are. When you read of a public transaction for a company or part of a company, you have a reference point to test your valuation skills. Good luck! QUESTION 1: Describe how the three networks (ABC, NBC, and CBS) played the prisoner’s dilemma game in the 1960s and 1970s in regarding advertising pricing, advertising inventory, purchasing of shows, and hiring of talent. QUESTION 2: How did Fox influence the other networks’ responses to its efforts to get behind their barriers to enter their market? QUESTION 3: How effective was Fox’s strategy of having synergistic media business? The analysis will be posted next Friday. Good luck! Besides understanding economies of scale, the next area you need to master is understanding the prisoner’s dilemma and how companies coexist or compete within barriers to entry. Remember that if the links do not work, then the materials are in a folder in the VALUE VAULT. Simply email Aldridge56@aol.com and request a key. What are the sources of competitive advantages in the soda industry? First we should look at industry structure. The cola companies buy raw materials of sugar, sweeteners and flavorings from many suppliers then they turn the commodities into a branded product which consists of syrup/concentrated combined with water and bottles. The companies are joined at the hip with their bottlers/distributors who then sell to many retail outlets. Selling bulky and heavy beverages lends itself to regional economies of scale advantages. The soda companies cannot operate successfully unless their bottlers and distributors are profitable and content whether company-owned or franchised. The existence of barriers to entry indicates that the incumbents enjoy competitive advantages that potential entrants cannot match. In the soft drink world, the sources of these advantages are easy to identify. First, on the demand side, there is the kind of customer loyalty that network executives, beer brewers and car manufacturers only dream about. People who drink sodas drink them frequently (habit formation), and they relish a constancy of experience that keeps them ordering the same brand, no matter the circumstances. Second, there are large economies of scale in the soda business both at the concentrate maker and bottler levels. Developing new products and advertising existing ones are fixed costs, unrelated to the number of cases sold. Equally important, the distribution of soda to the consumer benefits from regional scale economies. 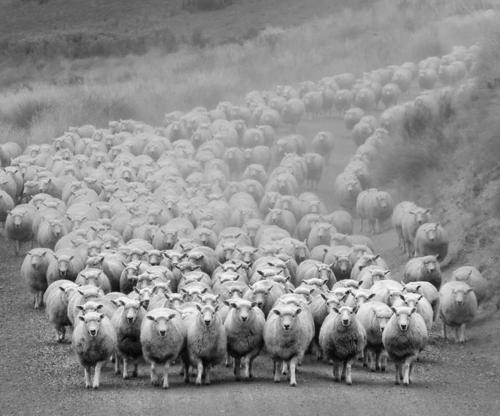 The more customers there are in a given region, the more economical the distribution. A bottler of Coke, selling the product to 40% to 50% of the soda drinkers in the market area, is going to have lower costs than someone peddling Dr. Pepper to 5% to 56% of the drinkers. Note the stability of market share and ROE. ROE dipped in 1980 and 1982 as Pepsi and Coke waged a price war. Yet, market shares did not change as a result of the price war—both companies were worse off. Pepsi gained market share in the late 1970s versus Coke. Coke was slow and clumsy to respond. Price wars between two elephants in an industry with barriers to entry tend to flatten a lot of grass and make customers happy. They hardly ever result in a dead elephant. Still, there are better and worse ways of initiating a price contest. Coke chose the worst. Coke chose to lower concentrate prices on those regions where its share of the cola market was high (80%) and Pepsi’s low (20 percent). This tactic ensured that for every dollar of revenue Pepsi gave up, Coke would surrender four dollars. Coke luckily developed New Coke which allowed it to attack Pepsi in its dominant markets in a precise way—minimizing damage to Coke’s profits–and force a truce in the price wars. They made visible moves to signal the other side that they intended to cooperate. Coca-Cola initiated the new era with a major corporate reorganization. After buying up many of the bottlers and reorganizing the bottler network, it spun off 51% of the company owned bottlers to shareholders in a new entity, Coca-Cola Enterprises, and it loaded up on debt for this corporation. With so much debt to service, Coca-Cola Enterprises had to concentrate on the tangible requirements of cash flow rather than the chimera of gaining great hunks of market share from Pepsi. PepsiCo responded by dropping the Pepsi Challenge, toning down its aggressive advertising and thus signaling that it accepted the truce. Profit margins improved. Operating profit margins went from 10% to 20% for Coca-Cola. Pepsi gain was less dramatic but also substantial. Both companies focused on ROE rather than market share and sales growth. The urge to grow, to hammer competitors and drive them out of business, or at least reduce their market share by a meaningful amount, had been a continual source of poor performance for companies that do have competitive advantages and a franchise, but are not content with it. My most surprising discovery: the overwhelming importance in business of an unseen force that we might call “the institutional imperative.” In business school, I was given no hint of the imperative’s existence and I did not intuitively understand it when I entered the business world. I thought then that decent, intelligent, and experienced managers would automatically make rational business decisions. But I learned over time that isn’t so. Instead, rationality frequently wilts when the institutional imperative comes into play. For example: (1) As if governed by Newton’s First Law of Motion, an institution will resist any change in its current direction; (2) Just as work expands to fill available time, corporate projects or acquisitions will materialize to soak up available funds; (3) Any business craving of the leader, however foolish, will be quickly supported by detailed rate-of-return and strategic studies prepared by his troops; and (4) The behavior of peer companies, whether they are expanding, acquiring, setting executive compensation or whatever, will be mindlessly imitated. But readers’ comments are even better. These contributors posted here: http://wp.me/s1PgpH-1302. I reposted below. Good work. In the 3 largest areas that they operated, Coors had almost 50% market share in 1977. By 1985 they had only 14% in that region, however they expanded to almost all the states and sold 16% more barrels. Also in 1977 Coors had a 20% operating margin, far ahead of any competitor. By 1985 it was down to 8%. Marketing expenses were the cause of this, jumping from 2.6% of revenues to 15%, far more than any major competitor. While Coors was expanding, all of their competitors (mostly AB and Miller) were taking a major chunk of their market share in the markets they previously dominated. It seems that the marketing expenses are what killed Coors’ margins. If Coors expanded its local market share in 1977 instead of jumping around their marketing expenses would’ve been much lower per barrel than all of their competitors. I fully agree with Dave’s analysis. Although there was advertising expenses were on an industry-wide rise since the late 70s (probably driven by PM’s takeover of Miller), Coors’ advertising expenses made up 15% of sales vs. an industry average of 10%. On a per-barrel basis, Coors spent $11/barrel on advertising in ’85, whilst AB spent $7/barrel. Reason for these high expenses was that the advertising expenses are primarily regional, and Coors had lost market share in its heart land (Mountain, Pacific, WSC) – 25% in ’77 to 15% in ’85 against AB and Miller, and had insufficient foothold in other states (in all non-heartland areas except for NE Coors had <10% market share). A crucial mistake Coors management made was to allow Miller and AB to fill the capacity gap in its heart-land (10 states west of Colorado), thereby losing market share and thereby weakening the EoS it had. It seems like Coors’ management was focused on its nation-wide roll and lost sight of defending its local market share. 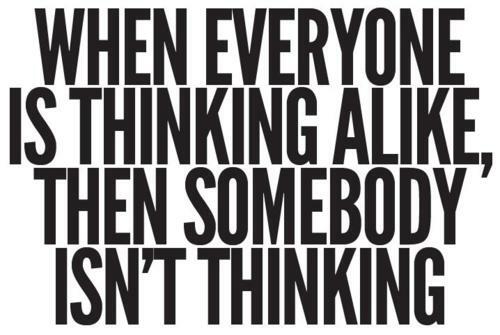 EXCELLENT POINT. It seems like AB enjoys EoS now. Step 1) Map out profitability per state to understand which states create a drag on Coors margin. My guess would be that this would be a combination of distance from its brewery and low ( <10%) market share) but this would require some further analysis. a) Coors strategy of maintaining full integration of its supply chain (e.g. owning its own transport company, generating its own power, etc). This may not be the best strategy in a mature market like beer. Other service-providers may have an cost-advantage, e.g. in transportation. Coors own transport company led to 10%-15% higher trucking costs thanks to low back haulage compared to independent transporters. b) Maintaining so many brands – Coors ran 4 different super premium brands vs. an industry average of 1. Even though super premium brands generated cash to fund advertising campaigns, the costs were pretty high ($20 – $ 35 Mln launch costs, $10 M annually advertising maintenance costs, and costs associated with running so different many packages on its production lines). Step 3) Abandon the ‘bleeder’ states, and focus on the strong states (its heartland). Defend market share aggressively by cutting prices, using the excess cash generated by having cut the fat as laid out in step 2 . I of course completely agree with you but do you have any insight on why they may have pursued the strategy that they did at the time? I have always been driven to buck the system, to innovate, to take things beyond where they’ve been. We let folks know we’re interested in them and that they’re vital to us. cause they are. Ready to move onto to the Coors Beer Case Study which is a lesson on what happens if a company loses its regional economies of scale advantage? If you had read this case study when it was published in 1986 would you have bought WMT and held on for five or seven years? What analysis would you need to do? Tomorrow I will post another strategic view of Wal-Mart so you can see other perspectives. Quantitative Easing explained in a cartoon video. http://www.youtube.com/watch?v=PTUY16CkS-k About five million viewers have watched this video of two bears (dogs?) asking simple questions about monetary policy. The theory at issue here is Keynesianism which assumes that stimuli from government, a category that includes QE2 (Quant. Easing for the second time), are beneficial. Really? Why? If economics can neither be explained in plain English nor understood then it’s probably bunk. In 1997, the year Amazon.com went public, its chief executive, Jeff Bezos, issued a manifesto: “It’s all about the long term,” he said. He warned shareholders “we may make decisions and weigh tradeoffs differently than some companies” and urged them to make sure that a long-term approach “is consistent with your investment policy.” Amazon’s management and employees “are working to build something important, something that matters to our customers, something that we can tell our grandchildren about,” he added. But shareholders seem never to have gotten the message. In October, when Amazon reported strong third-quarter revenue growth and earnings that were pretty much what the company had predicted, but indicated it would be spending more to support continued growth, investors hammered its stock. Amazon shares dropped nearly $30, or 13 percent, to $198 a share in just one day, Oct. 25. This week they were trading even lower, at $181. The notion that public companies should maximize shareholder value by managing for the long term is pretty much gospel among good-governance proponents and management experts. Jack Welch advanced the concept in a seminal 1981 speech at the Pierre Hotel in New York and elaborated on it in subsequent books and articles while running General Electric, when G.E. was widely lauded as the best-managed company in the country. It has been especially championed in Silicon Valley, where technology companies like Google have openly scorned Wall Street analysts and their obsession with quarterly estimates and results by refusing to issue earnings guidance. Amazon, in particular, has been true to its word to manage for the long term. It remains one of the world’s leading growth companies and its stock has soared 12,200 percent since its public offering. In late October it reported quarterly revenue growth of 44 percent to almost $11 billion, which came on the heels of 80 percent growth a year ago. “We’re seeing the best growth which we’ve seen since 2000, meaning in 2010 and so far over the past 12 months ending September,” the chief financial officer, Thomas Szkutak, told investors in October. But operating earnings fell sharply to $79 million. While that was in line with most estimates, Amazon offered a forecast for the fourth quarter in which it said it might lose as much as $200 million or earn as much as $250 million, and even the high end would represent a 47 percent drop. Amazon seems to be taking customer focus to new levels, willing to run its ever-bigger global business while earning little or nothing in return. To the dismay of some, Mr. Bezos even takes a long-term view of price cuts. “With rare exceptions, the volume increase in the short term is never enough to pay for the price decrease,” he told shareholders in 2005. But that kind of thinking, he added, is “short term. We can estimate what a price reduction will do this week and this quarter. But we cannot numerically estimate the effect that consistently lowering prices will have on our business over five years or 10 years or more.” Selling at low prices may undercut profits, but they create “a virtuous cycle that leads over the long term to a much larger dollar amount of free cash flow, and thereby to a much more valuable Amazon.com,” Mr. Bezos said. Amazon has done little to dampen speculation that it is selling its revamped Kindle e-reader devices and its recently introduced Fire tablet at a loss. Amazon simply doesn’t think like most other companies. When “we think about the economics of the Kindle business, we think about the totality,” Mr. Szkutak said. “We think of the lifetime value of those devices. So we’re not just thinking about the economics of the device and the accessories. We’re thinking about the content.” In other words, profits will come down the road when Kindle users buy content through Amazon. For Amazon, long-term growth confers two major benefits: the kind of economies of scale enjoyed by Wal-Mart and eliminating or weakening competitors. 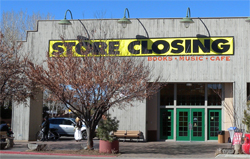 The book retailer Borders has been forced out of business and a rival, Barnes & Noble, is struggling. Best Buy, the electronics retailer, reported this week that earnings plunged 29 percent, despite higher revenue and a surge of Black Friday sales, because the chain had to cut prices and offer free shipping to compete with Amazon. Amazon inflamed many competitors this holiday season by offering extra discounts to shoppers who took mobile devices into stores and then used them to compare prices and order from Amazon. The revamped Kindle line and especially the new Fire tablet illustrate Amazon’s long-term strategy. “Amazon has much greater ambitions than near-term profits or margins,” Ken Sena, an Evercore analyst, said. The Fire “isn’t meant to be another iPad,” Mr. Devitt noted. “It’s a device to sell Amazon content. All indications are it’s a success. It’s the most gifted item on Amazon. It’s too soon to tell, but it seems more promising than it’s getting credit for.” This week Amazon said it had sold more than a million Kindles a week for the last three weeks. Amazon revenue continues to rise spectacularly. Its profits, however, have fallen, as margins are squeezed by aggressive product pricing and surging use of the company’s popular free-shipping option. So, the question seems to be, will those strategies help Amazon build what Warren Buffett would call a moat – a protective fortress around its business that long-term allows it to reap substantial profits and build value? Stewart, author of several fabulous business books, including “Den of Thieves,” about the late-1980s Wall Street scandals, and a Pulitzer Prize winner for his work at the Wall Street Journal, is such a well-regarded thinker about companies that we at YCharts were forced to stop and consider his point of view; he’s not just another pro-Amazon tout. We have regularly written that we view Amazon as overvalued and have marveled at how its recent growth has made it less profitable, not more so. The critics have certainly influenced Amazon’s share price in recent months. 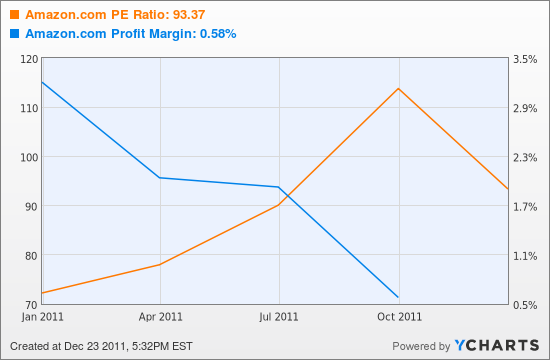 Yet the PE remains in the 90s, and this for a company with a plunging and razor-thin profit margin. Stewart’s admiration of Amazon certainly makes sense if you’re an Amazon customer. The service is wonderful, and like so many American shoppers during this holiday season we have ventured into actual stores very few times because shopping online – from Amazon and its many imitators – is so much easier. That change in consumer behavior seems to suggest a moat is forming. But does the moat encircle Amazon protectively, or is it instead a moat encircling bricks-and-mortar retailers into a market-share-losing ghetto? The brutal price-comparison ethic Amazon unleashed on the book business years ago helped it take huge market share. But it also rendered the book business less profitable for all players. And as that ethic unfolds across product categories – aided most recently by Amazon’s Price Check app – results at Amazon and Best Buy (BBY) would suggest the greater transparency on pricing is helping consumers, but not so much retailers. Running Borders out of business, sadly for Amazon and other booksellers, didn’t make the book business more profitable again. Rather, the pricing model Amazon brought to the market seems to have rendered book retailing a crummier business. And it’s also unlikely that consumer electronics and the other categories Amazon is transforming will, once a few large competitors go bust, miraculously become more profitable. There isn’t a shortage of players in any of these markets and the consumer behavior Amazon helped spur – constant price shopping, demanding free or reduced-priced shipping – would seem impossible to reverse. Actually, Amazon does detail the cost in its 10-K filings (page 26). Its net shipping costs – total shipping costs minus what Amazon collects from customers for shipping – totaled $1.39 billion in 2010, up 63% from $849 million the prior year. Total sales were only growing by 40%. So net shipping costs were equal to 4% of sales in 2010, versus 3.4% in 2009. That trend may have accelerated during 2011, and could largely explain why profits have fallen. The strategy Stewart lauds is doing a bang-up job of boosting revenue. And consumers love Amazon’s service. But it’s hard to see how the company is going to fatten its margins when competition remains fierce; consumers have been taught to demand low-low prices (and free shipping); and beyond elegant technology, Amazon’s main tools for attracting consumers are both margin killers — low-low prices and free shipping. 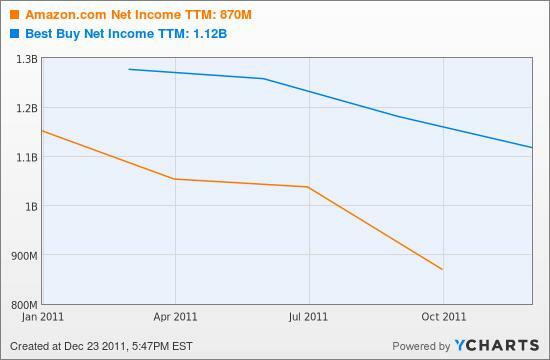 Certainly the Kindle is an attempt to build a moat around Amazon’s book business. Selling the devices at what has been reported as a loss suggests the company sees future payoff from Kindle-owning consumers downloading their reading (no shipping expense here) exclusively from Amazon. But in the more general merchandise categories that increasingly make up Amazon’s sales, it’s hard to see how to insert such a loyalty device. Stewart’s argument seems in part based on the notion that, forgoing current profits, Amazon must be managing for the long term. But if your very pricey stock is reliant on spectacular revenue growth, a cynic might reason that a strategy of adding sales — even if they’re increasingly less profitable (or money-losing) – appears short-term and somewhat desperate. Amazon management is smart, as is Jim Stewart, and investors could be inviting ruin by shorting Amazon shares. But to us, the company hasn’t made a persuasive case that it’s building a moat – just that it’s delivering great service and selling stuff cheaper than the next guy. End. Let’s revisit our study of whether Amazon has a competitive advantage or not after we finish our study of Competition Demystified (in the VALUE VAULT).